In Kali Yuga, wealth alone will be considered the sign of a man's good birth, proper behaviour and fine qualities. And law and justice will be applied only on the basis of one's power. Men and women will live together merely because of superficial attraction, women will not respect her in laws and men will also be inclined to their in laws and be subservient to wives.success in business will depend on deceit. Womanliness and manliness will be judged according to one's expertise in Physical gratification, and a man will be known as a brahmana just by his wearing a thread. A person's spiritual position will be ascertained merely according to external symbols, and on that same basis people will change from one spiritual order to the next. A person's propriety will be seriously questioned if he does not earn a good living. And one who is very clever at juggling words will be considered a learned scholar. A sacred place will be taken to consist of no more than a reservoir of water located at a distance, and beauty of women will depend on one's hairstyle only.Filling the belly will become the goal of life, and one who is audacious will be accepted as truthful. He who can maintain a family will be regarded as an expert man, and the principles of religion will be observed only for the sake of reputation. As the earth thus becomes crowded with a corrupt population, whoever among any of their social classes shows himself to be the strongest will gain political power. The citizens will suffer greatly from cold, wind, heat, rain and snow. They will be further tormented by quarrels, hunger, thirst, disease and severe anxiety and depression. ksiyamanesu—having become smaller; dehesu—the bodies; dehinam—of all living entities; kali-dosatah—by the contamination of the age of Kali; varna-asrama-vatam—of the members of varnasrama society; dharme—when their religious principles; naste—have been destroyed; veda-pathe—the path of the Vedas; nrnam—for all men; pasanda-pracure—mostly atheism; dharme—religion; dasyu-prayesu—mostly thieves; rajasu—the kings; caurya—banditry; anrta—lying; vrtha-himsa—useless slaughter; nana—various; vrttisu—their occupations; vai—indeed; nrsu—when men; sudra-prayesu—mostly low-class sudras; varnesu—the so-called social orders; chaga-prayasu—no better than goats; dhenusu—the cows; grha-prayesu—just like materialistic homes; asramesu—the spiritual hermitages; yauna-prayesu—extending no further than marriage; bandhusu—family ties; anu-prayasu—mostly very small; osadhisu—plants and herbs; sami-prayesu—just like sami trees; sthasnusu—all the trees; vidyut-prayesu—always manifesting lightning; meghesu—the clouds; sunya-prayesu—devoid of religious life; sadmasu—the homes; ittham—thus; kalau—when the age of Kali; gata-praye—is almost finished; janesu—the people; khara-dharmisu—when they have assumed the characteristics of asses; dharma-tranaya—for the deliverance of religion; sattvena—in the pure mode of goodness; bhagavan—the Supreme Personality of Godhead; avatarisyati—will descend. By the time the age of Kali ends, the bodies of all creatures will be greatly reduced in size, and the religious principles of followers of varnasrama will be ruined. The path of the Vedas will be completely forgotten in human society, and so-called religion will be mostly atheistic. The kings will mostly be thieves, the occupations of men will be stealing, lying and needless violence, and all the social classes will be reduced to the lowest level of sudras. Cows will be like goats, spiritual hermitages will be no different from mundane houses, and family ties will extend no further than the immediate bonds of marriage. Most plants and herbs will be tiny, and all trees will appear like dwarf sami trees. Clouds will be full of lightning, homes will be devoid of piety, and all human beings will have become like asses. At that time, the Supreme Personality of Godhead will appear on the earth. Acting with the power of pure spiritual goodness, He will rescue eternal religion. Significantly, these verses point out that most so-called religions in this age will be atheistic (pasanda-pracure dharme). In confirmation of the Bhagavatam’s prediction, the United States Supreme Court has recently ruled that to be considered a religion a system of belief need not recognize a supreme being. Also, many atheistic, voidistic belief systems, often imported from the Orient, have attracted the attention of modern atheistic scientists, who expound on the similarities between Eastern and Western voidism in fashionable, esoteric books. These verses vividly describe many unsavory symptoms of the age of Kali. Ultimately, at the end of this age, Lord Krsna will descend as Kalki and remove the thoroughly demonic persons from the face of the earth. cara-acara—of all moving and nonmoving living beings; guroh—of the spiritual master; visnoh—the Supreme Lord, Visnu; isvarasya—the Supreme Personality of Godhead; akhila—of all; atmanah—of the Supreme Soul; dharma-tranaya—for the protection of religion; sadhunam—of saintly men; janma—the birth; karma—of their fruitive activities; apanuttaye—for the cessation. Lord Visnu—the Supreme Personality of Godhead, the spiritual master of all moving and nonmoving living beings, and the Supreme Soul of all—takes birth to protect the principles of religion and to relieve His saintly devotees from the reactions of material work. sambhala-grama—in the village Sambhala; mukhyasya—of the chief citizen; brahmanasya—of the brahmana; maha-atmanah—the great soul; bhavane—in the home; visnuyasasah—of Visnuyasa; kalkih—Lord Kalki; pradurbhavisyati—will appear. Lord Kalki will appear in the home of the most eminent brahmana of Sambhala village, the great soul Visnuyasa. asvam—His horse; asu-gam—swift-traveling; aruhya—mounting; devadattam—named Devadatta; jagat-patih—the Lord of the universe; asina—with His sword; asadhu-damanam—(the horse who) subdues the unholy; asta—with eight; aisvarya—mystic opulences; guna—and transcendental qualities of the Personality of Godhead; anvitah—endowed; vicaran—traveling about; asuna—swift; ksaunyam—upon the earth; hayena—by His horse; apratima—unrivaled; dyutih—whose effulgence; nrpa-linga—with the dress of kings; chadah—disguising themselves; dasyun—thieves; kotisah—by the millions; nihanisyati—He will slaughter. These verses describe the thrilling pastimes of Lord Kalki. Anyone would be attracted by the sight of a powerful, beautiful man riding on a wonderful horse at lightning speed, chastising and devastating cruel, demonic people with the sword in His hand. Of course, fanatical materialists may argue that this picture of Lord Kalki is a mere anthropomorphic creation of the human mind—a mythological deity created by people who need to believe in some superior being. But this argument is not logical, nor does it prove anything. It is merely the opinion of certain people. We need water, but that does not mean man creates water. We also need food, oxygen and many other things that we do not create. Since our general experience is that our needs correspond to available objects existing in the external world, that we appear to need a Supreme Lord would tend to indicate that in fact there is a Supreme Lord. In other words, nature endows us with a sense of need for things that actually exist and that are in fact necessary for our well-being. Similarly, we experience a need for God because we are in fact part of God and cannot live without Him. At the end of Kali-yuga this same God will appear as the mighty Kalki avatara and beat the pollution out of the demons. atha—then; tesam—of them; bhavisyanti—will become; manamsi—the minds; visadani—clear; vai—indeed; vasudeva—of Lord Vasudeva; anga—of the body; raga—from the cosmetic decorations; ati-punya—most sacred; gandha—having the fragrance; anila—by the wind; sprsam—of those who have been touched; paura—of the city-dwellers; jana-padanam—and the residents of the smaller towns and villages; vai—indeed; hatesu—when they have been killed; akhila—all; dasyusu—the rascal kings. After all the impostor kings have been killed, the residents of the cities and towns will feel the breezes carrying the most sacred fragrance of the sandalwood paste and other decorations of Lord Vasudeva, and their minds will thereby become transcendentally pure. 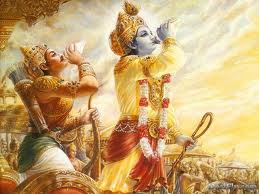 Nothing can surpass the sublime experience of being dramatically rescued by a great hero who happens to be the Supreme Lord. The death of the demons at the end of Kali-yuga is accompanied by fragrant spiritual breezes, and thus the atmosphere becomes most enchanting. tesam—of them; praja—of progeny; visargah—the creation; ca—and; sthavisthah—abundant; sambhavisyati—will be; vasudeve—Lord Vasudeva; bhagavati—the Supreme Personality of Godhead; sattva-murtau—in His transcendental form of pure goodness; hrdi—in their hearts; sthite—when He is situated. When Lord Vasudeva, the Supreme Personality of Godhead, appears in their hearts in His transcendental form of goodness, the remaining citizens will abundantly repopulate the earth. yada—when; avatirnah—incarnates; bhagavan—the Supreme Lord; kalkih—Kalki; dharma-patih—the master of religion; harih—the Supreme Personality of Godhead; krtam—Satya-yuga; bhavisyati—will begin; tada—then; praja-sutih—the creation of progeny; ca—and; sattviki—in the mode of goodness. yada—when; candrah—the moon; ca—and; suryah—the sun; ca—and; tatha—also; tisya—the asterism Tisya (more commonly known as Pusya, extending from 3° 20´ to 16° 40´ Cancer); brhaspati—and the planet Jupiter; eka-rasau—in the same constellation (Cancer); samesyanti—will enter simultaneously; bhavisyati—will be; tada—then; krtam—Satya-yuga. When the moon, the sun and Brhaspati are together in the constellation Karkata, and all three enter simultaneously into the lunar mansion Pusya—at that exact moment the age of Satya, or Krta, will begin.